Jago Holmes is a Qualified and experienced Trainer who has worked with hundreds of runners successfully! He has his own 5K Training for Beginners Program! You may be one of those people who have trouble getting your running program off to a good start. Have you ever started to run and failed? Are you troubled because you're never able to see the amazing results that long term running offers, because running is so sporadic? It's really tough trying to learn the basics of running without someone to help. Your goals can become wishywashy and difficult to reach. Imagine have a whole program with all the things you need to know about running and succeeding! Feeling more comfortable and loving your body. Watching excess weight come off in just a short time. Understanding what to eat and how. Staying fit, slim, healthy and balanced. Being proud of a happier and healthier YOU! More confidence to run a 5K race. The best running habits develop during your 6 weeks. You have plenty of reasons why you want to become a better runner! 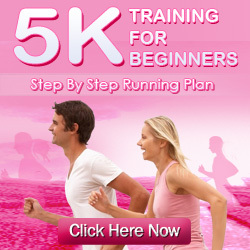 By taking advantage of the 5K running program you could be fit, happy, healthy and slim in 6 months! Take a look at this Program! The Program will benefit the new runner, the person who is coming back to the sport or just the person wanting to add this sport to their other work outs.